The Recruitment process of any organization provides an insight into their personal evolution. The gradual growth of an organization into realizing who it is and what are the client needs. Clarion comprises of top developers and it takes pride in the team of developers being its sole USP. An equipped team is the result of a rigorous screening process and a constant sharpening of skills. 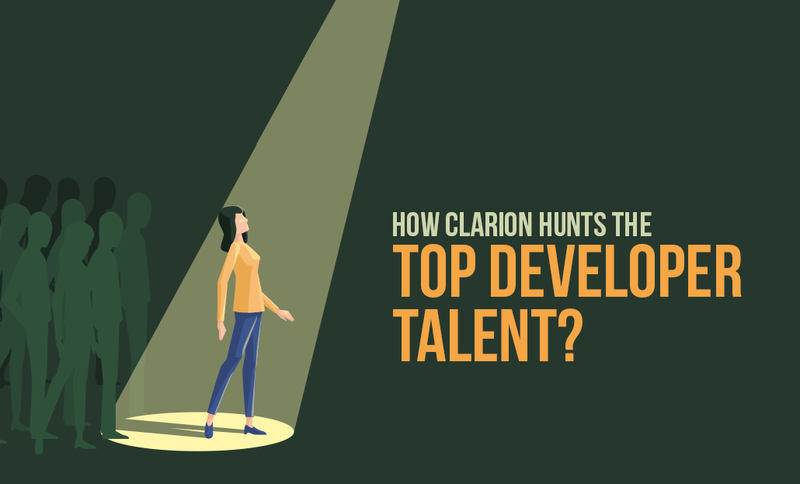 Here we provide you a peek into the meticulous talent search process that Clarion undergoes to hire the top talent available. Clarion doesn’t practice doors. There are no barriers to delivery. We do not motivate individuals with glorified hierarchies to climb. The major growth here is learning and expanding oneself. At Clarion you have freedom from micro-management. We believe freedom is the greatest responsibility. We work in autonomous teams backed by shared technical support and guidance. We provide opportunities for ownership and delivery. Clarion is for everyone who can comprehend the idea of taking complete ownership and exercising end-to-end delivery. Prescreening is a processing of filtering out applicants based on their goals, earlier in the funnel. Saving the efforts of the technical team, prescreening helps identify candidates who are here for a short stint or not in it a 100%. Clarion stays away from serial job hoppers. Applicants who are either just fishing or checking their valuation in the market. We rather have an indefinite closing date on a job posting than hire a nomad with erratic aspirations. Probing with Open ended questions helps identify such entities. What aspect of development do you like? What are the shortcomings you faced your previous job assignment? Which of your previous management decisions do you not concur with? What are your future aspirations pertaining to your development domain? Ability to communicate effectively is also evaluated during the prescreening stage. We assert having Active Listening skills and Prompt, Complete, Correct and Concrete Communication. Having a command over the language and an aptitude of the mediums of communication are the key factors. There are 2 perspectives to assess the technical proficiency of an individual – Knowledge and Concepts. Technical knowledge is being accustomed with every nook and corner of your core technology and keeping updated with developments. Conceptual clarity is being cognizant with the possible pathways; not necessarily having walked all of them. Since the technology domain has spread far and out, each candidate is equipped with more than just two to three technologies. We assess based on practical hands-on scenarios that the developers have previously faced. Designing solutions requires not just knowledge but dexterity to use available data to foresee predictive workflows. Problem solving ability and creativity are the key skills that we analyze. Ask bridging questions – From their previous experiences to your current requirements. The problem-solving process is more important than reaching the answers. Write short briefs on how the candidate was, based on the evaluation parameters. The OCEAN five factor model is a broadly accepted and spread instrument to evaluate the relationship between personality and academic behavior. They are dimensions of an individual’s personality that can provide his prospective readiness to fit into a particular role. Openness – (Rigid – Timid – Receptive – Susceptible – Erratic) Willingness to try new activities. Degree of Inclination towards unconventional ideas. Readiness to change and Adaptability. Conscientiousness – (Obsessive – Organized – Serene – Dynamic – Impulsive) Tendency to restrain impulsive actions, degree to which a person is planned, organized or methodical. Easy-going or laid-back. Agreeableness – (Submissive – Empathetic – Receptive – Argumentative – Dismissive) The quality of interactions that a person has with an individual. Neuroticism – This is a measure of the Emotional stability of an individual and the level of Anxiety that critical scenarios might trigger. A composed and collected individual indicates high Stability. This is the most crucial part of the evaluation that Clarion adheres significant weightage to. When recruiting an individual every organization expects him/her to be there for the long haul. This is largely based on whether the person is a fit into the CULTURE of the organization. Company culture is the shared beliefs, customs, values and manner of interoperations that have evolved over through the years of existence; not necessarily governed by any written rules. Culture eventually reflects the rapport we share with our stakeholders and clients. Clarion believes in a culture of Responsibility and Ownership. Clarion takes pride in Individuals who work towards honing their skills and broadening their area of expertise and in the course growing Clarion. Rather than recruiting individuals on a trial basis, we try to evaluate individuals very early in the screening process. Taking individuals beyond the routine interview setup and having a congenial conversation helps in having a candid dialog. Probe into the previous experiences and the organizational setup one has worked with helps assess the values an individual has incorporated. What was the greatest day in your career so far? How was your relationship with your previous team? Which kind of personalities did you have a tough time working with and how did you reach a resolution? What are work practices have you grown to follow in the past years? What was your experience working with the previous client? At first glance the Clarion recruitment process does appear to be stringent and multilayered, but we make the journey as seamless as possible. The Clarion workplace has a welcoming atmosphere and we try to keep it appealing and intriguing. The sole motive of the process being, filtering zealous, proficient and right candidates for the position. At Clarion, the right developers with minimal grooming and induction, are ready to hit the ground running.